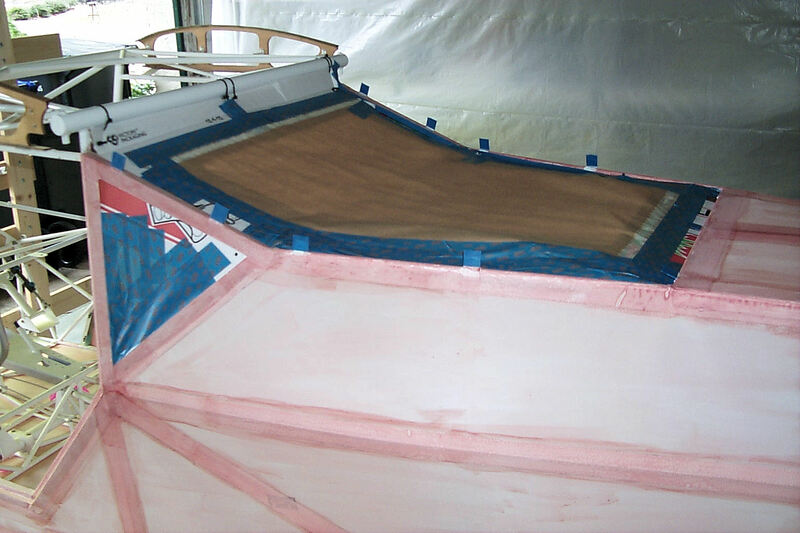 Painting: My goal is to complete painting all the fabric surfaces. 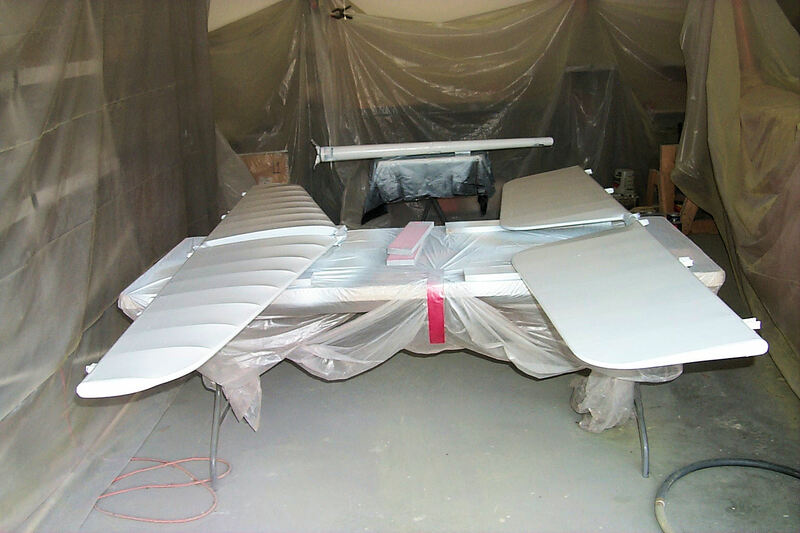 The wings are already painted to the 3rd coat of Poly-Spray and are ready for the final color coats. 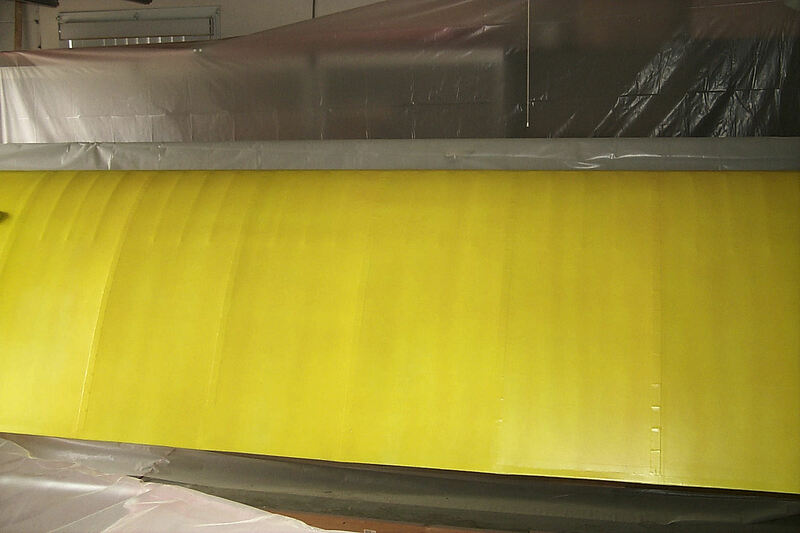 I'm using Poly-Tone and the final color is to be Lemon Yellow. As advised in the Poly Fiber manual and strongly recommended by John McBean at Kitfox I'm first spraying a couple coats of white before the final color. 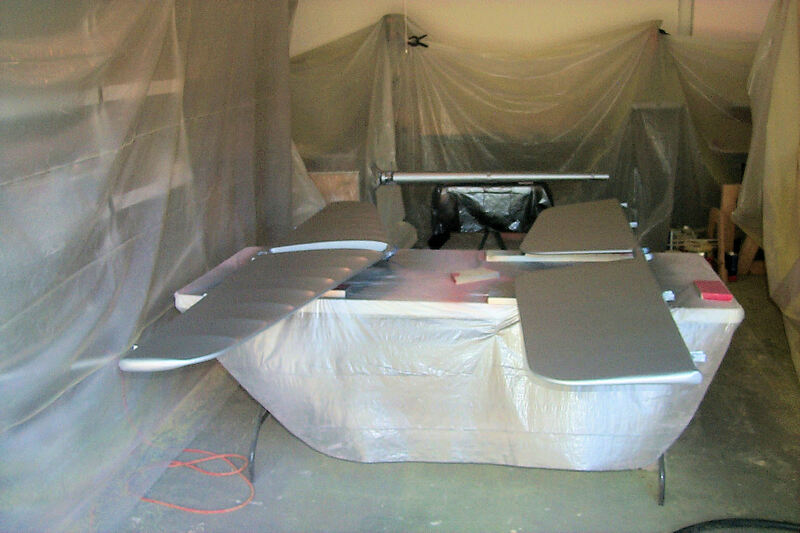 All the non-fabric surfaces will be primed with white epoxy primer. If the fabric is also painted white then the final color has a chance at being uniform from nose to tail. 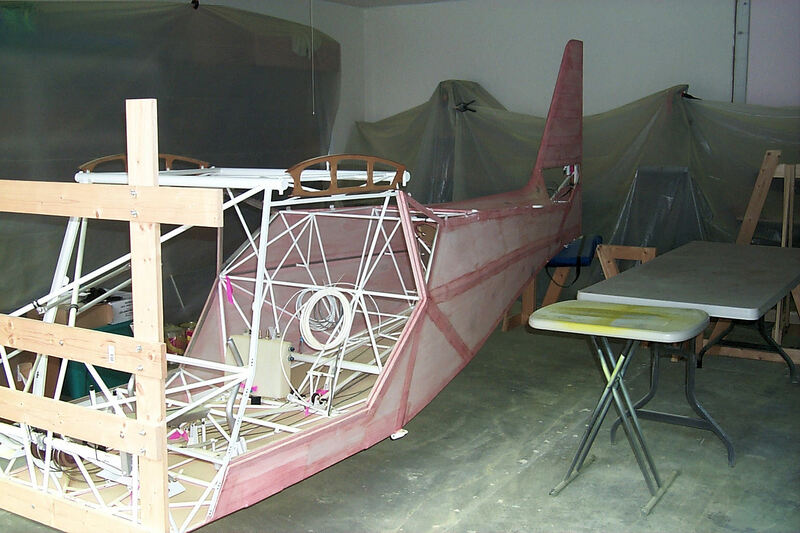 When the wings are complete I'll take them to my hangar to make room for painting the tail feathers and fuselage. This is when I have to do the complete build-up. 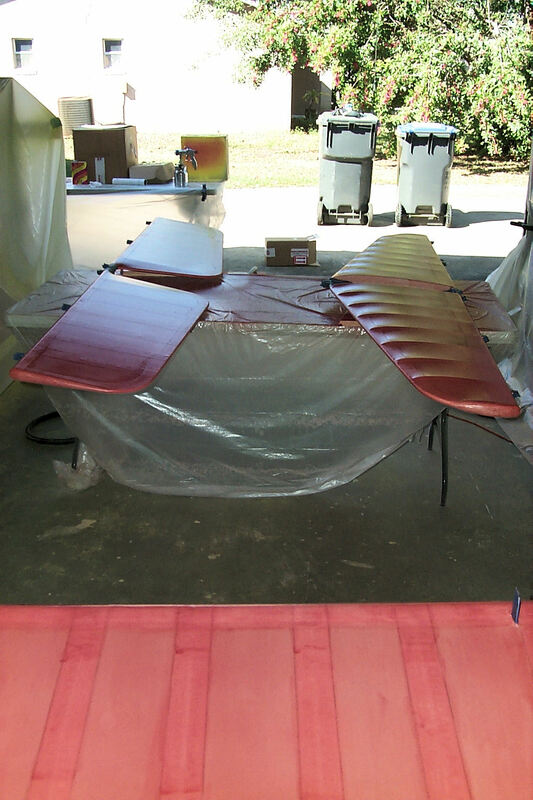 Two coats of Poly-Brush, three of Poly-Spray and then color. A somewhat messy rendition of my proposed final paint scheme. 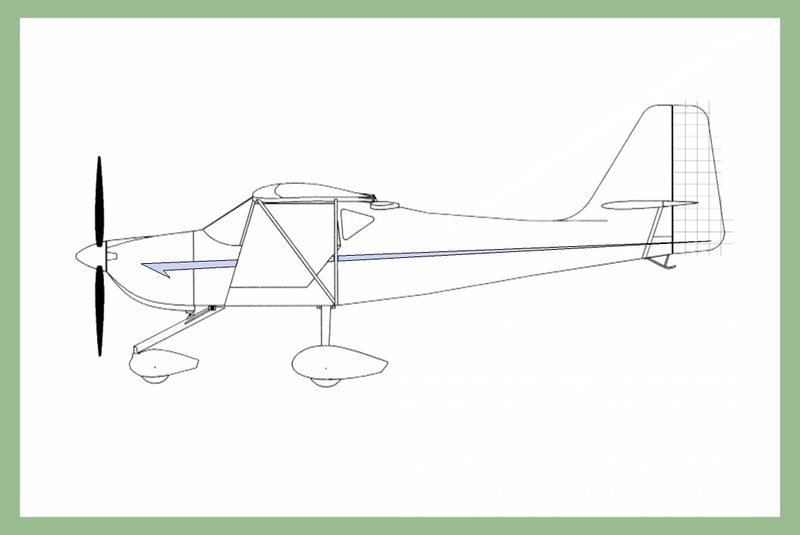 What's missing are the numbers and a kitfox decal on the tail. 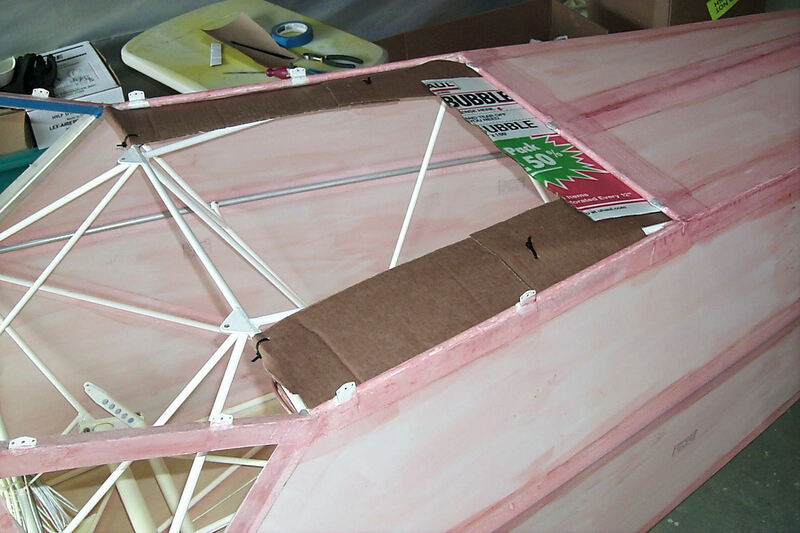 You can see some reference lines for a checkerboard pattern on the rudder. I've abandoned that idea in favor of the kitfox logo. There will be a gap in the stripe to allow 12in numbers. We live close to the Bahamas and large numbers are required when flying there. 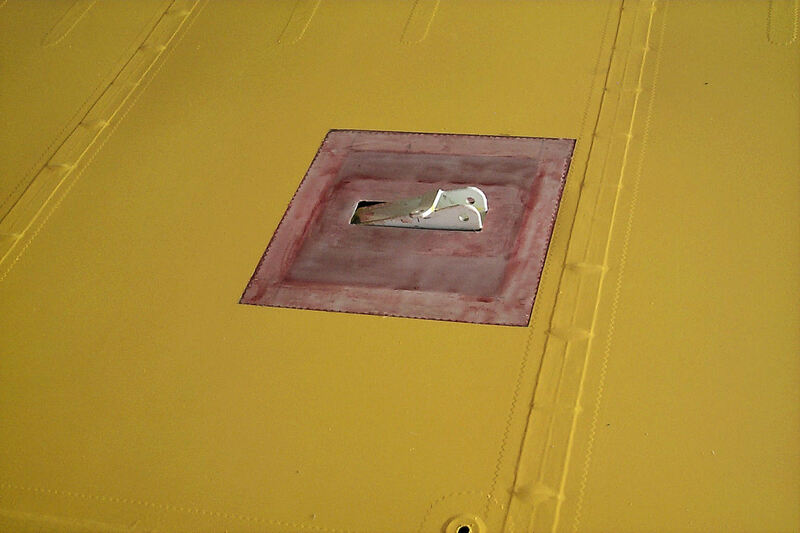 The stripe and numbers will be painted Insignia Blue and will be applied very close to the end of the project. 19 December 2012: White! The book implies that one coat is sufficient but, since you can see the Poly-Spray underneath, I'm going to apply another coat. 20 December 2012: The second coat of white. For the next couple of days strong northerly winds are predicted. Since the garage door faces north I may not be able to do any painting. The lack of adequate ventilation precludes me from painting with the door closed. 24 December 2012: YELLOW! 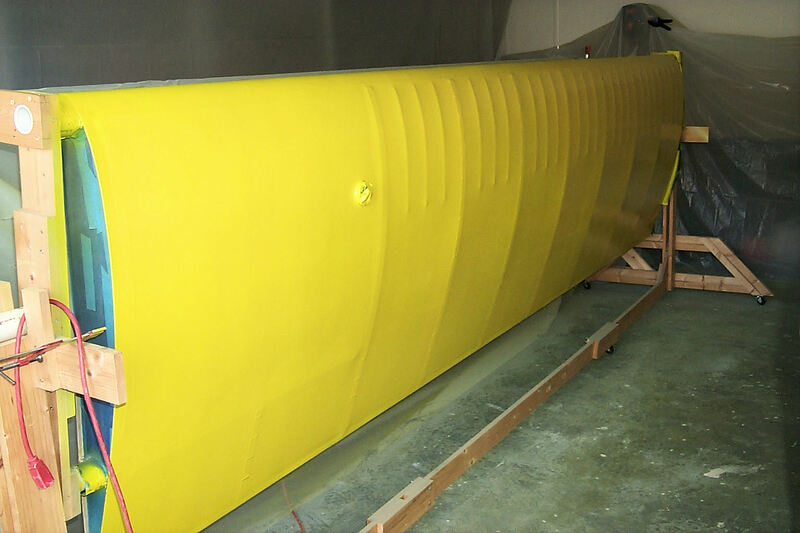 The first coat, which is why you can see variation in the color. 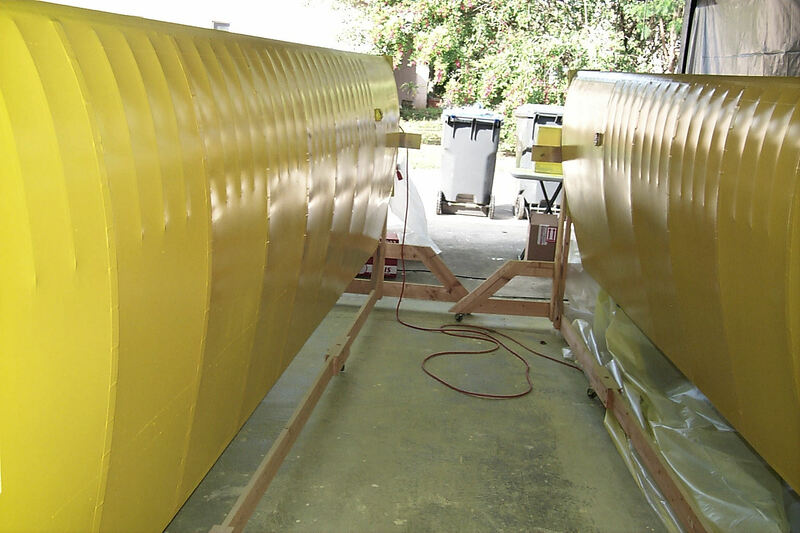 1 January 2013: The final coat. Yesterday I applied the second coat and today I applied the third coat. After all the layers of Poly-Brush, Poly-Spray, and Poly-Tone the weave of the fabric still shows. Each layer is incredibly thin. 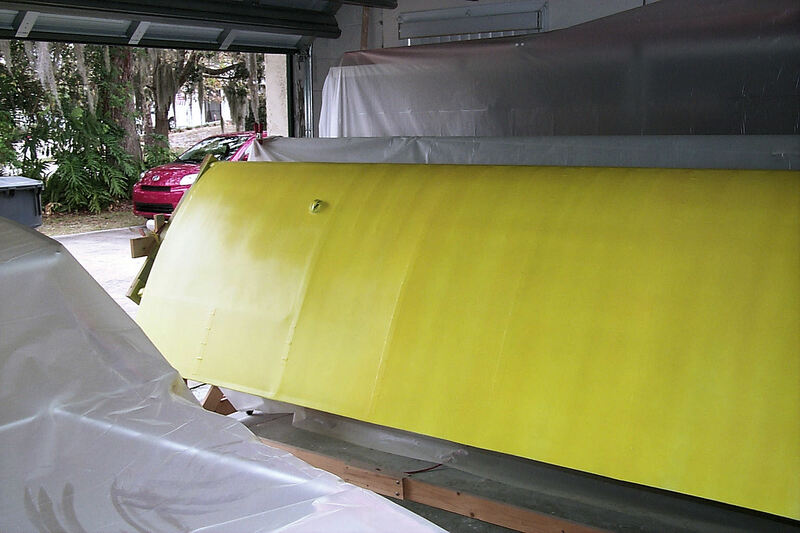 6 January 2013: One more coat. After close inspection I decided to apply another coat. This time I had the spray gun adjusted correctly and finally achieved an acceptable surface finish. This was done over the last couple of days playing tag with the weather. 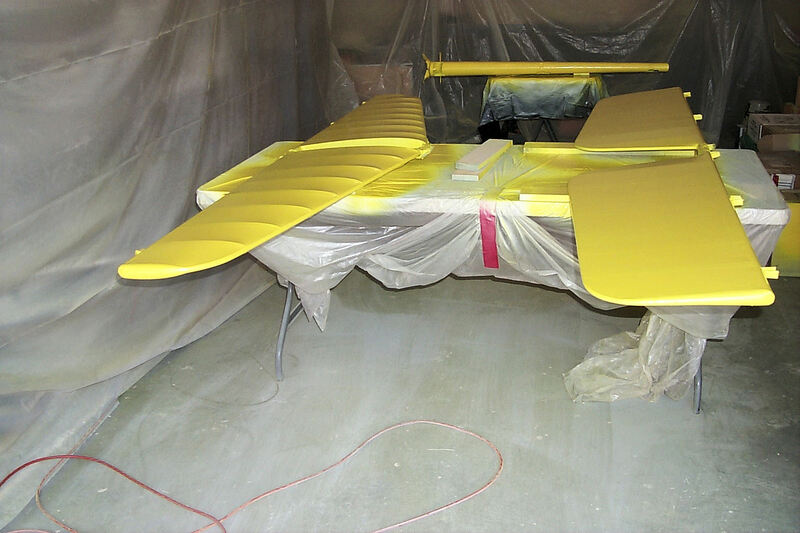 It's possible that the next wing will only need three coats of yellow as long as I keep the gun well adjusted. 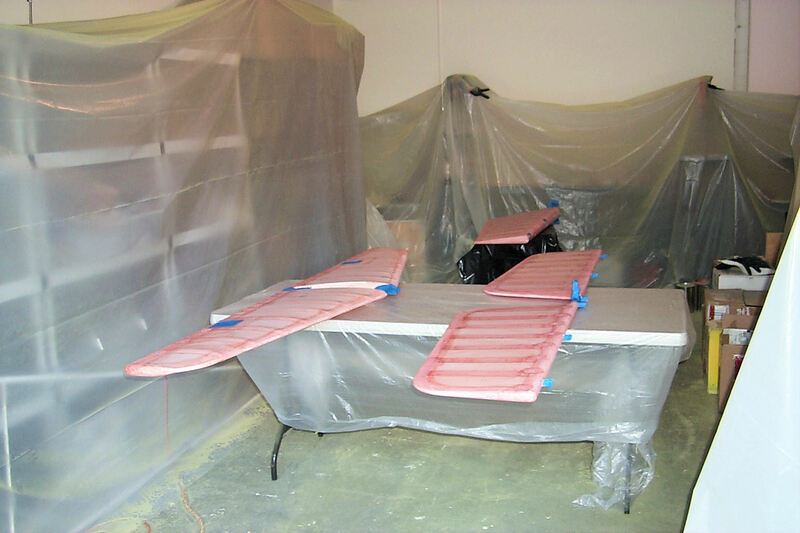 8 January 2013: Started painting the other wing. First coat of white. 11 January 2013: Yesterday I finished the white, today I started the yellow. I'm getting much better coverage. Previously I was painting with a too narrow pattern. 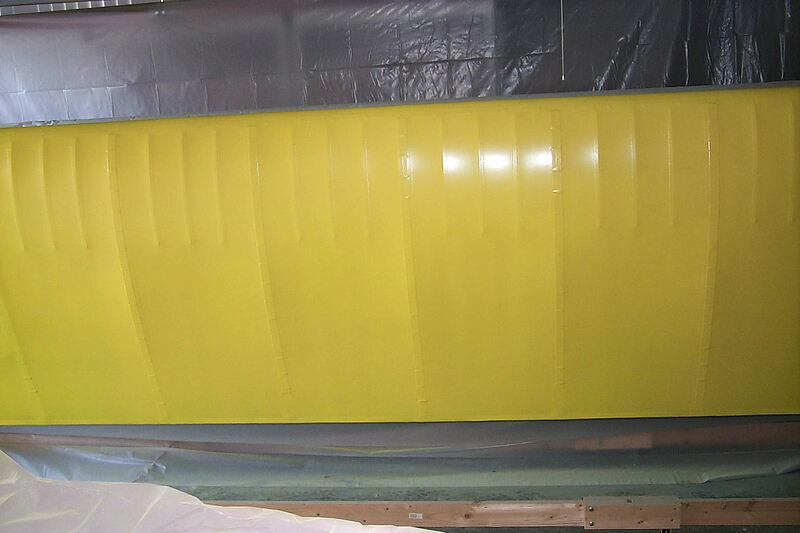 The wider pattern is laying the paint more evenly. 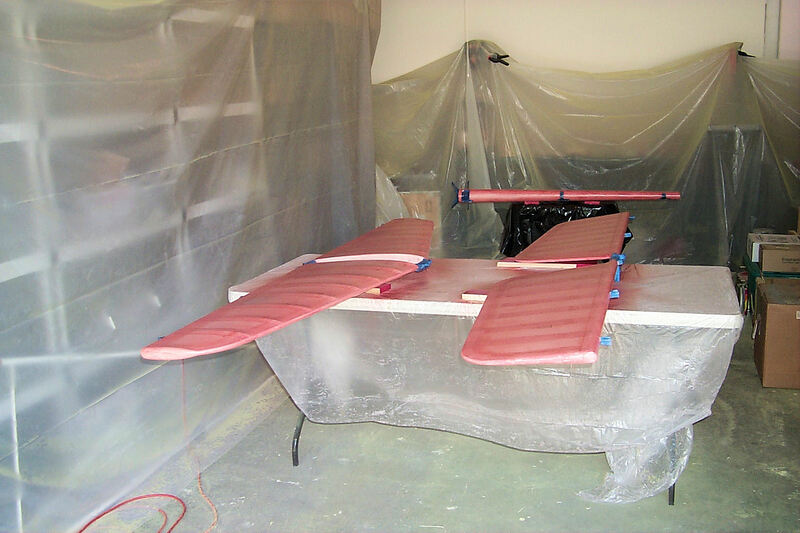 13 January 2013: The wings are finished! You can see that the floor is covered with overspray. 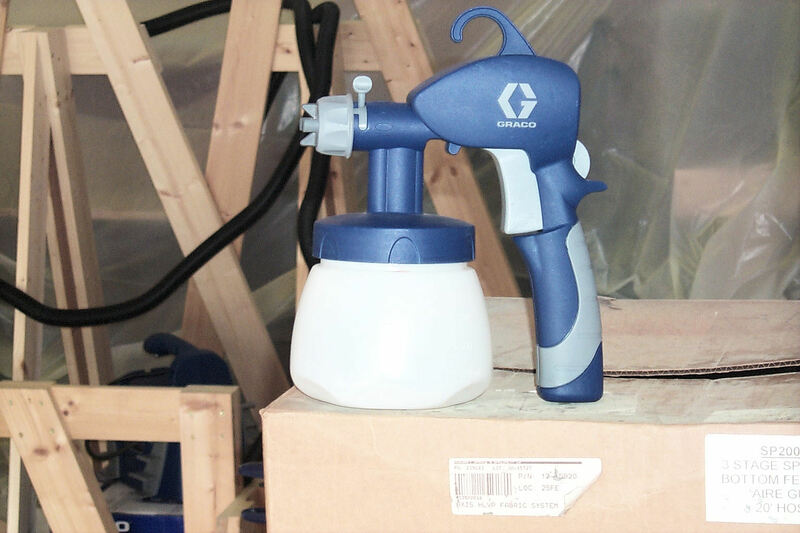 With Poly-Tone applied with a HVLP sprayer the overspray amounts to a fine, dry dust that's easily cleaned up with a broom and dust brush. 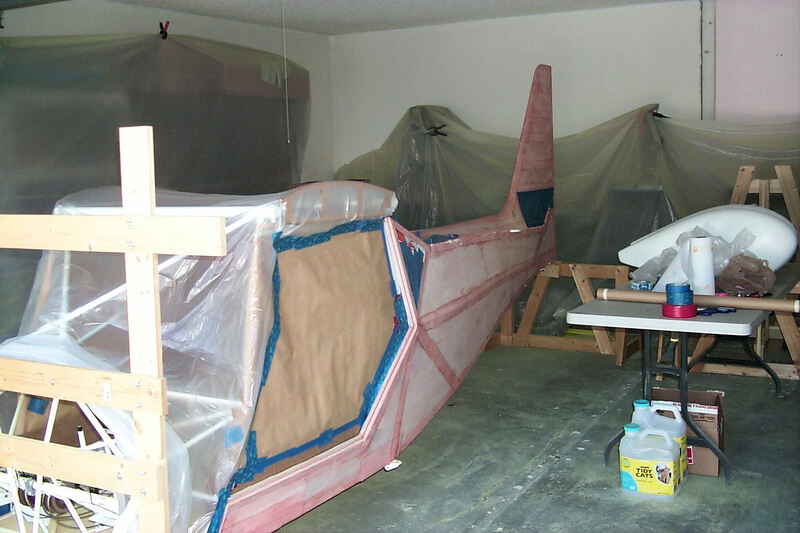 Going on from here: I'll store the wings in the hangar to make more room in the garage for painting the tail feathers and the fuselage. 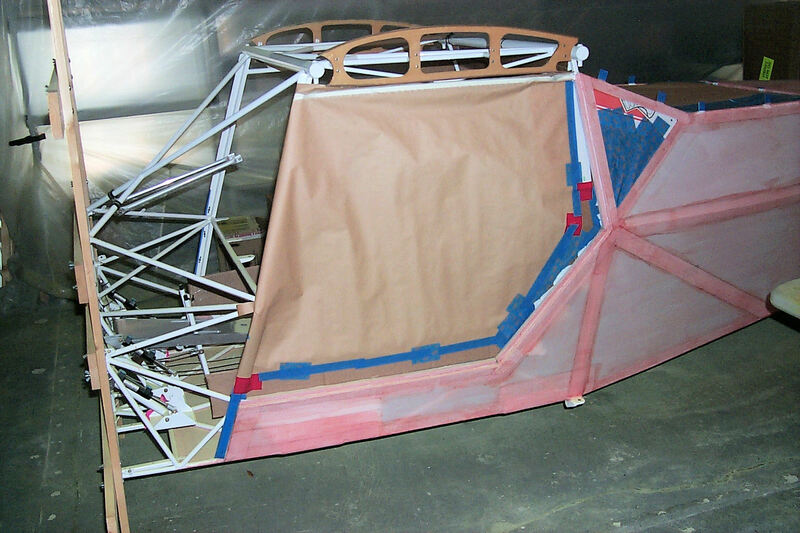 Then it will be on to final assembly. I'm beginning to imagine that I can see the "light at the end on the tunnel." 25 January 2013: I know! It's been a while. 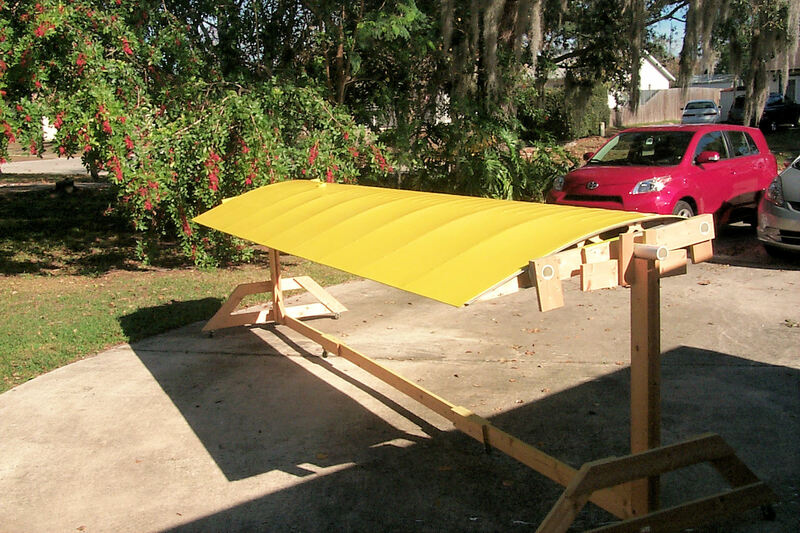 Life gets in the way of kit building but, finally, my brother and I are able to transfer the wings to the hangar. Tomorrow I'll cover them with protective plastic sheets. 26 January 2013: Another shop realignment. 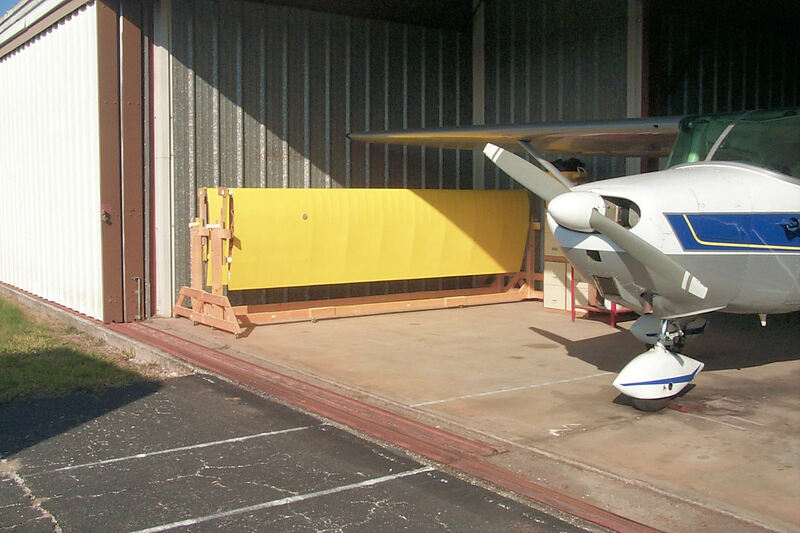 I started the day by going to the hangar and covering the wings with drop cloths. 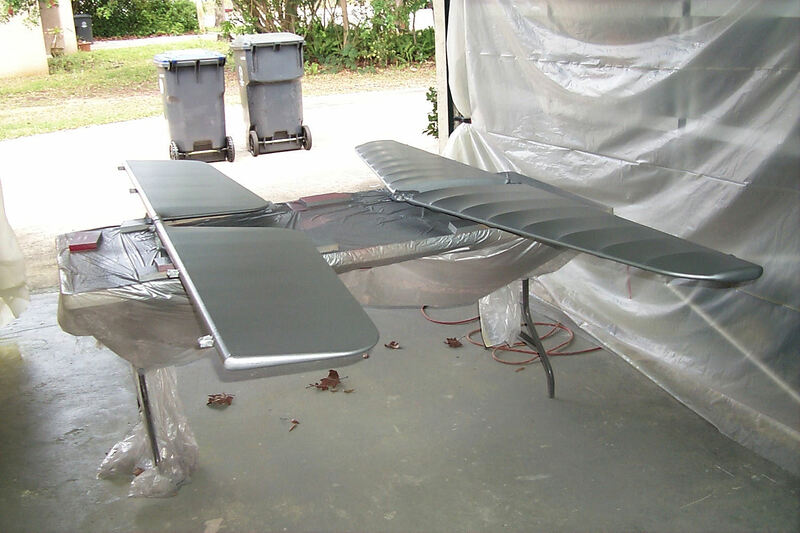 The rest of the day was spent making the tail feathers ready for painting. 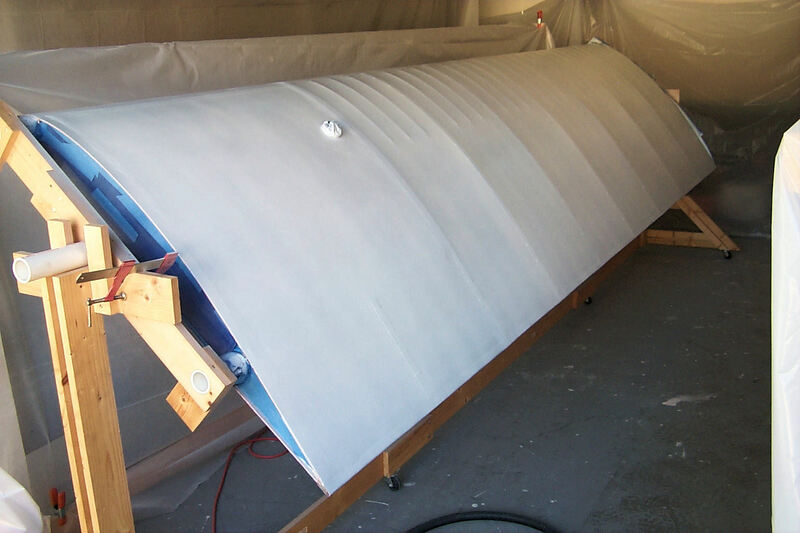 27 January 2013: First coat of Poly-Brush. I spray one side, wait until it's dry to the touch, turn everything over, and spray the other side. 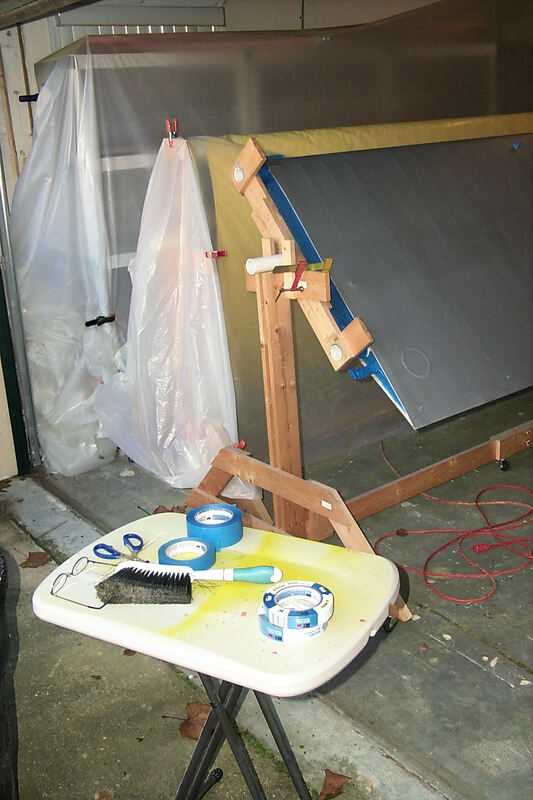 1 February 2013: My painting rig. 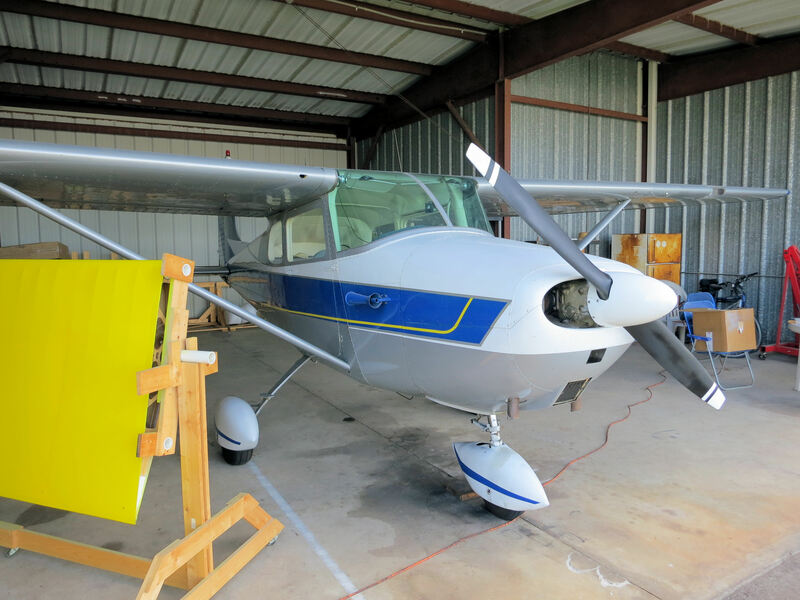 I bought this from Aircraft Spruce. 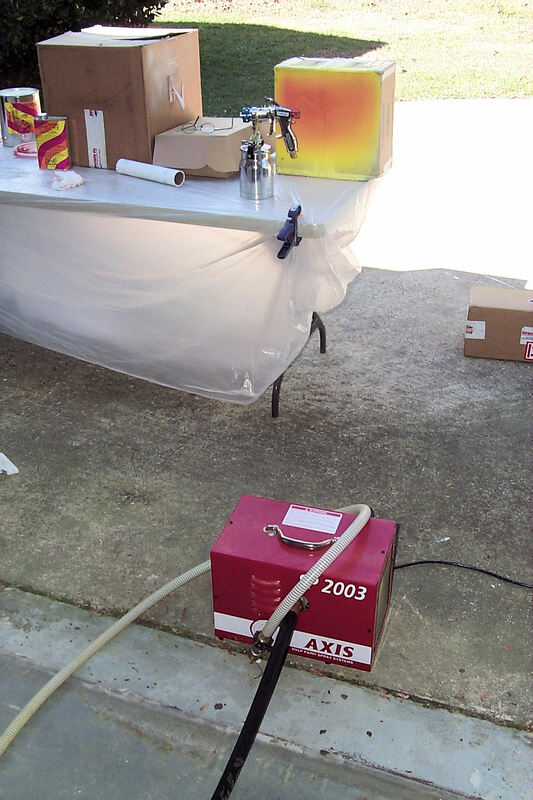 I'm not an expert on spray painting equipment so I was attracted to a pre-packaged system meant for fabric. It has served me well. Second (and last) coat of Poly-Brush. 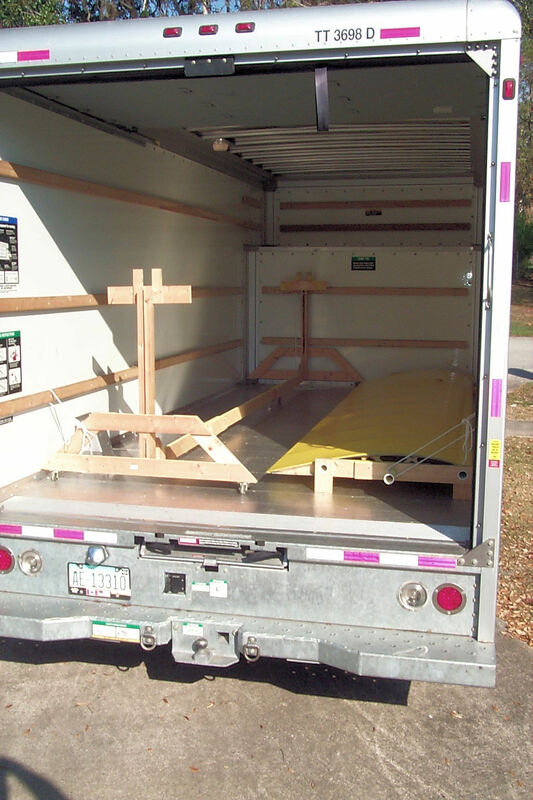 9 February 2013: After a week of other commitments pulling me away from the kit. 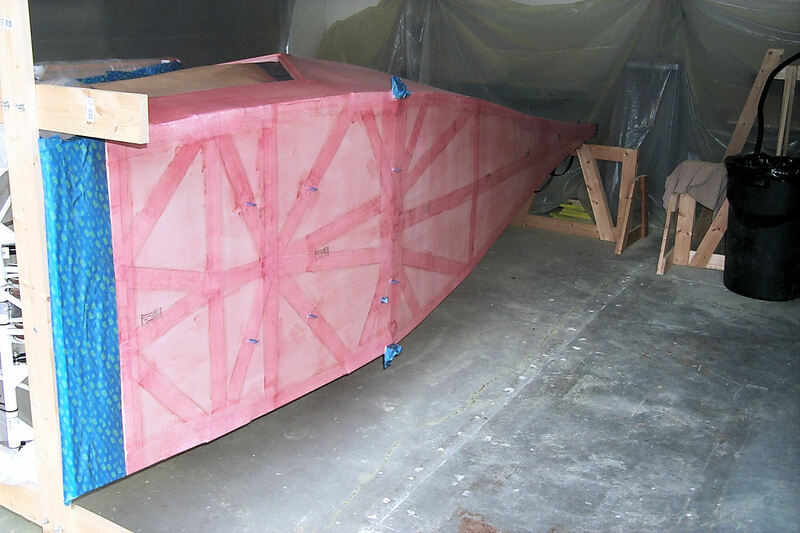 I'm able to carve out some time to apply the first coat of Poly-Spray. Patches complete! Now I have to build up all the layers of Poly-Brush, Poly-Spray, and Poly-Tone. Serves me right for missing this detail in the Builder's Manual. 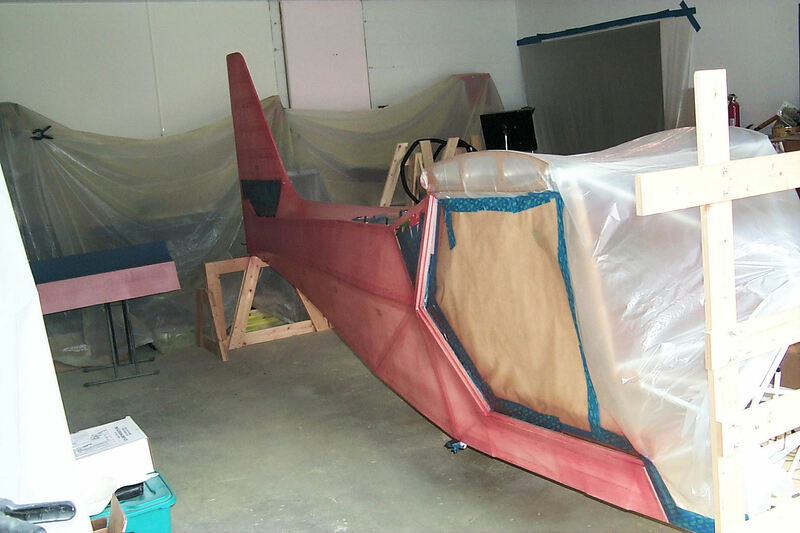 19 February 2013: I Sprayed the second coat of Poly-Spray on the tail feathers. No photo. It would look exactly like the photo of the first coat. 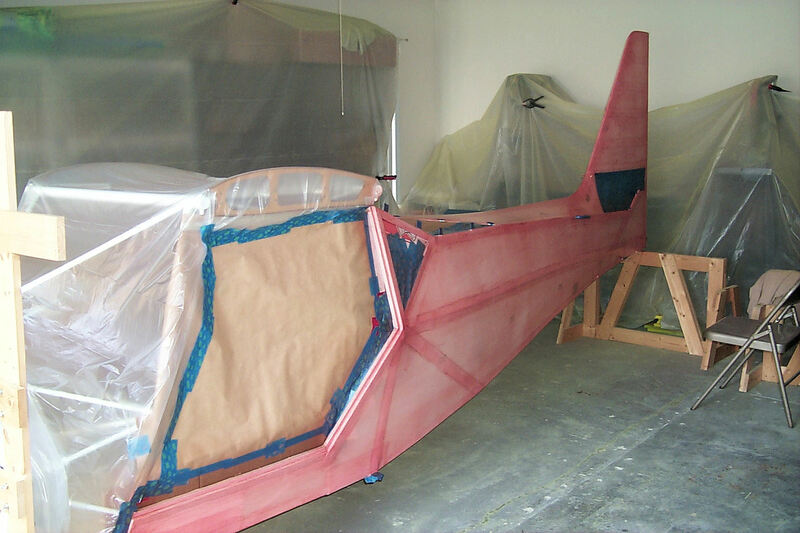 23 February 2013: Final coat of Poly-Spray. The weather and my work schedule has conspired to limit my kit building time. When the wind blows in the wrong direction I can't paint. The wind was okay today but, even then, a few stray leaves made it into the shop. 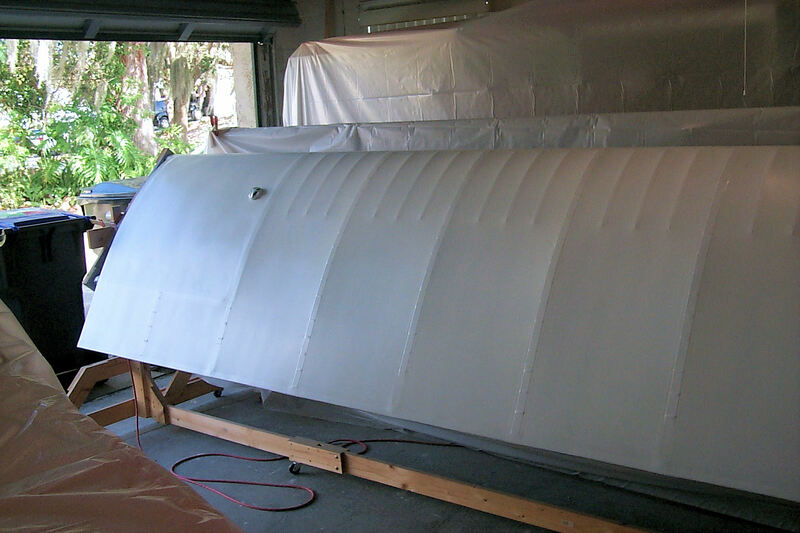 1 March 2013: First coat of white. 7 March 2013: It's cold down in Florida! 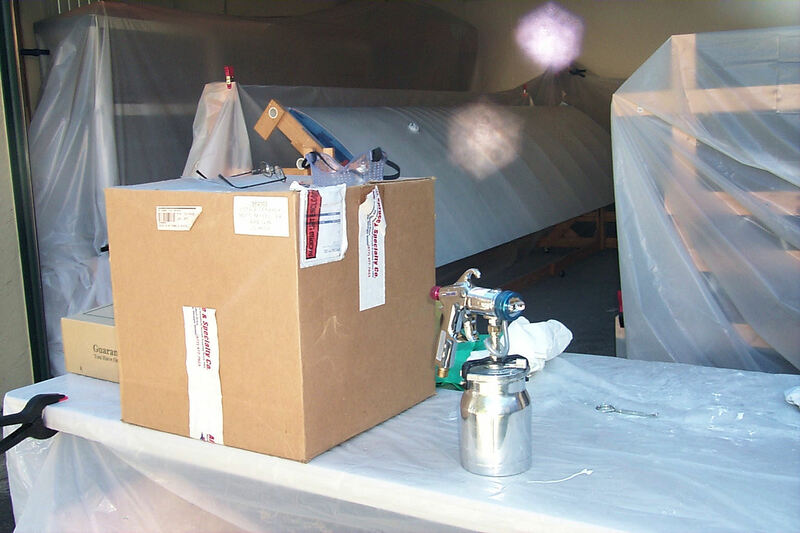 The Poly-Fiber manual stipulates that the air temperature must be at least 60F before painting. We've had days of temperatures in the mid 50's. Today the thermometer climbed above 60 and I applied the second and final coat of white. 8 March 2013: Yellow! First coat. 17 March 2013: After returning from a gathering of tuba players! Hosted by euphonium and tuba professor Marc Dickman at the University of North Florida in Jacksonville who is also an AVIATOR. (Tuba playing pilots are everywhere. The world is not safe.) This being my first free day, I took the opportunity to apply the second and last coat. The tail feathers are finished. 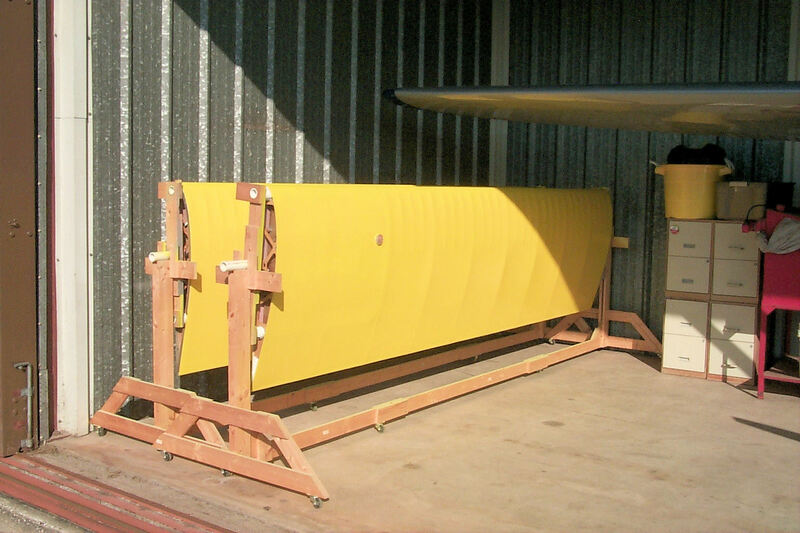 18 March 2013: On to the fuselage. Plenty of cleaning and masking needs to be done before spraying paint. 23 March 2013: After two days of false starts I come up with a viable plan. An experienced painter would probably laugh at this but, I first made a secure border with cardboard secured with zip ties. 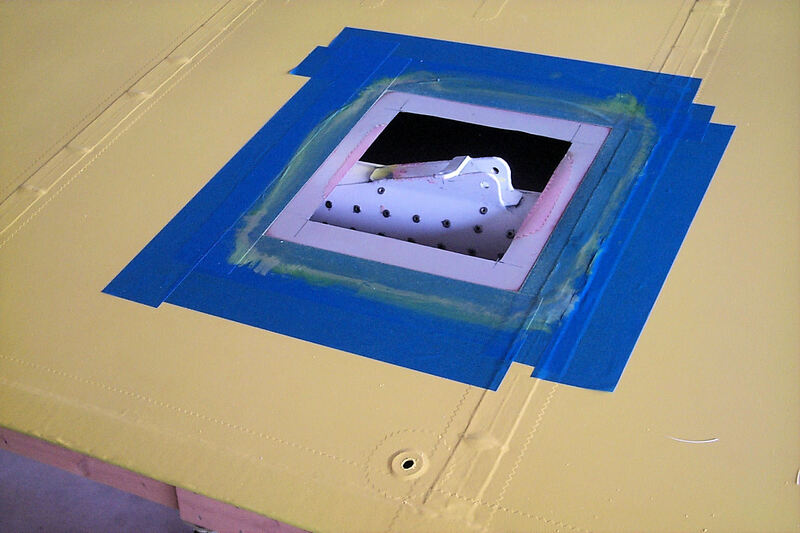 The masking was then much easier to tape in place. 27 March 2013: Slow and steady. Since I'm making this up on the fly I spend more time scratching my head than actually working. 6 April 2013: Professorial duties draw me away. After a busy week I'm finally back to work on the kit. Once I attend to a few details I'll be ready to paint. 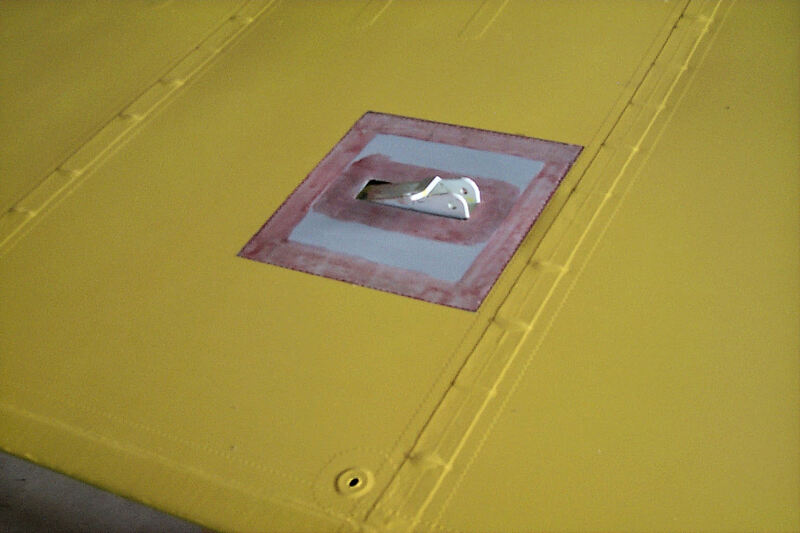 And, yes, I purchased wheel pants with the improved nose wheel design. 20 April 2013: Yesterday my schedule finally cleared enough to let me put some serious time on the kit and then I screwed up. While cleaning my spray gun I damaged the packing around the needle. 4 plastic washers that are not very expensive but are vital to the operation of the gun. They're on order but I'm dead in the water until they arrive. 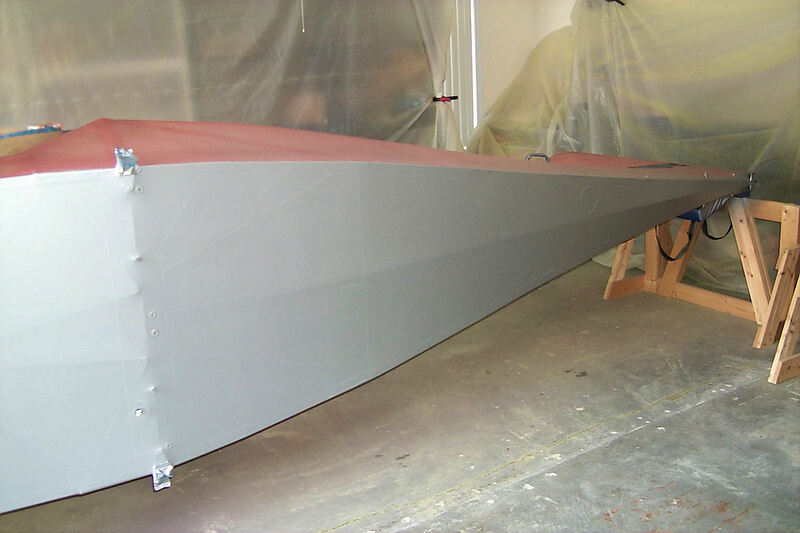 39 April 2013: The real first coat. 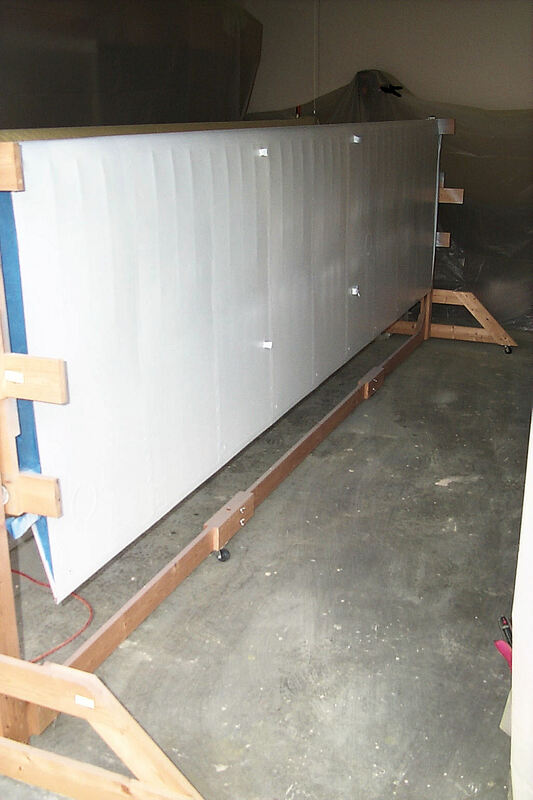 What I applied the other day was quite thin due to the mal-adjustment of the spray gun. Today the gun was adjusted properly and I am happy with the results. 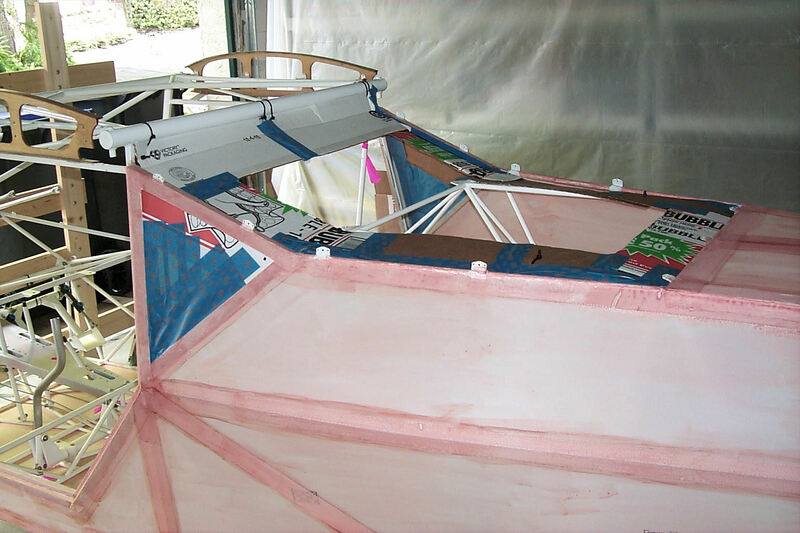 4 May 2013: Yesterday my brother helped me turn the fuselage on its side. 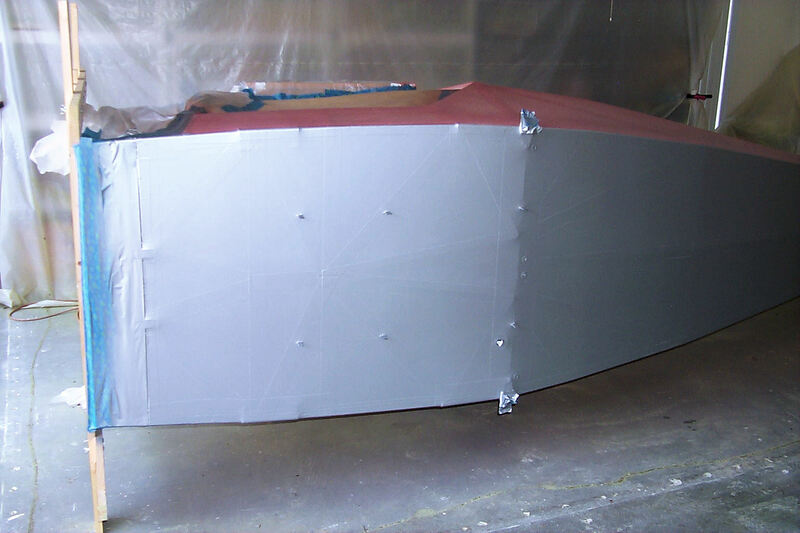 Today I applied the first coat of sprayed Poly-Brush to the bottom. 8 May 2013: I'm back shooting with my old camera. It's been relegated to dusty shop conditions. 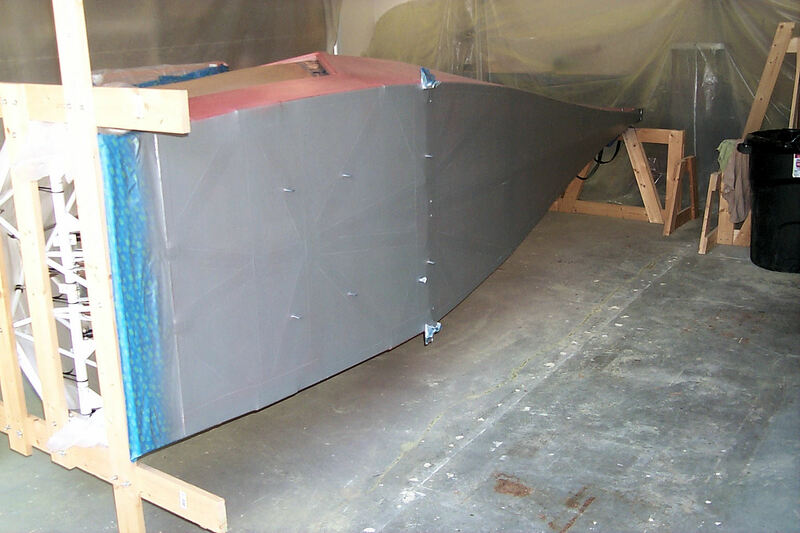 The belly gets its first coat of Poly-Spray. 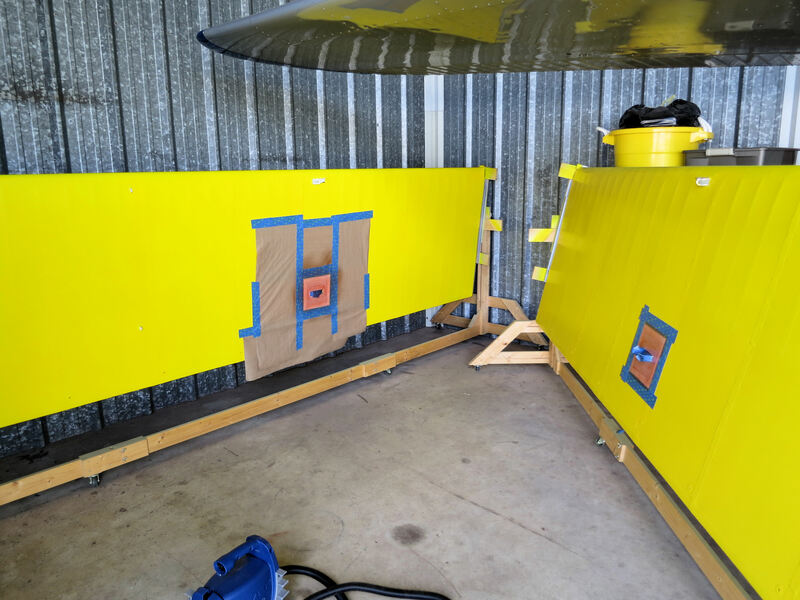 10 May 2013: The final coat.